Hey look what we've got here: a new death band from the Czech Republic... It looks like they not do only have good beers and pretty girls over there ;-) !!!!!!! 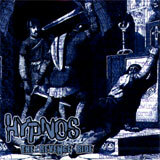 So Hypnos are bringing out their second album, produced by Harris Johns, and believe me it is a pretty good one from Morbid Records (where do they get all these names ???). Formed by ex members of Krabathor, the band is certainly going to reach something soon in this branch. The voice and the art of singing sound a bit like Mille from Kreator and Glen Benton from Deicide. The drums parts go sometimes a bit faster than usual and it gives a little touch of grind. Some constructions remind me a bit of Sinister or Deicide, especially when the voice goes deep down below (this is is a compliment guys). I Am The Wind is a great mid tempo. And here we go for a nice cute acoustic intro in Lost followed by Heroism Of New Era a hammering neckbreaker. In fact you will find a bit from everything in The Revenge Ride: death, thrash, grind. If the guys couldn't do it with Krabathor give'em a chance with Hypnos. There are a good band and bring something fresh and brutal to this kind of scene. So let's go for a sweet revenge or a ride ?????? Well ok that's an easy one but hey enjoy it ; - ).